First, what is Lupin the III? It is one of the all time favorite anime in Japan or maybe in the whole world. The manga was released way back 1967 until 1981 while the Anime is aired during 1971 until 2012. Lupin III is the gradson of the master thief Arsene Lupin. With his cohorts Daisuke Jigen and Goemon Ishikawa XIII and his love interest Fujiko Mine, he pulled off the greatest heists of all time while always escaping the grasp of Inspector Koichi Zenigata. And now guess what? Japan nailed it! 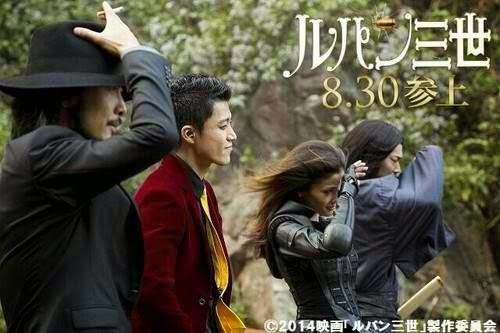 They made it into a live action that will be aired on 30th of August, 2014 all over in Japan. Starring Shun Oguri just so you know Shun is also the Rui Hanazawa the silent boy, one of the member of F4 in Hanayori Dango which is a Japanese version of Meteor Garden. , Tetsuji Tamayama, Go Ayano, Meisa Kuroki and Tadanobu Asano, there's more! Jerry Yan of Meteor Garden of Taiwan, Kim Joon of F4 - Boys Over Flower of Korea, Nic Tate, Nirut Sirijanya & many foreign artist. Wait, What?! Seriously, one more and F4 is re-united again. Hahahaha! The story line is based on the manga series which was published August 1967 to 1969. They began filming the movie last October 3 and ended on December 26, 2013. They already have visited Singapore, Hong Kong, Thailand and Philippines for the venues/shoot of their film. Before taking the film, Shun practiced for 10 months of action training and lost 8 kilograms I can visualized him *drools* while Ayano gained 10 kilograms for him to fit perfectly the role of Ishikawa. As of now there are still no announcement if when they'll distribute the copies for foreign viewing. I just hope that they wont make it too much modernized that we can't see the beauty of its 80's or 90's feels. How about your thoughts and expectations for this movie? Share it with us!.